As we took off from the marina this day, the air was relatively clear. But, as we moved along a thick fog settled in on the ICW. Our view was reasonably good, though, because we could always see the sides of the channel. 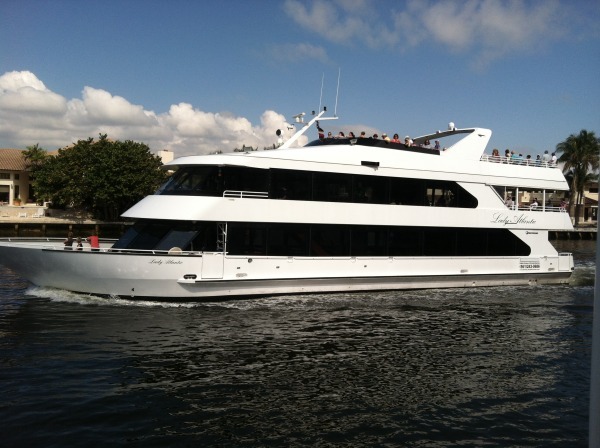 A few hours in the day, we were joined by this large yacht- the "Kathleen Windridge" on her way to Boca Raton. 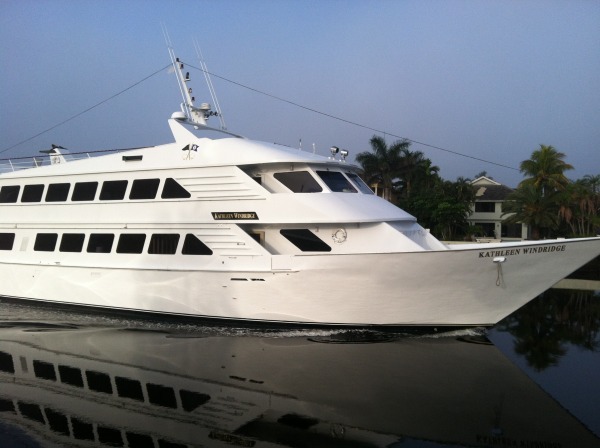 We looked her up online and discovered that she is 142' long and is a one of a charter yacht fleet in the area. Today she was piloted by what appeared to be her fulltime crew, with no guests aboard. Today was the day of 14 bridges. This particular section of the ICW requires constant attention and (poor Bruce) constant calculations and re-calculations of time/speed/distances. Timing that many bridges in one day is lots of work to say the least. It is definitey not a relaxing experience. But, the view is lovely..... And the day improved to be spectacular. We believe this was Boca Bay. It looked like a nice and very popular anchorage. We encountered some tour boats as well through here. This was the "Lady Atlantic". We got lots of wavers as they glided past us. We decided that this little resort looked very "Palm Beach" and couldn't help but wonder what it was like inside. It was almost exactly across from the boat show docks. Last but not least, I grabbed this pic because I thought it was funny. Do you think this is a house or a hotel? In Palm Beach, it COULD be a house..... and that boat has to be at least 100 feet long, probably longer. Oh well, I'll never know for sure. At the end of the day we stopped over at the Loggerhead Marina in Palm Beach Gardens. There is not much to walk to there that we are aware of. Besides, walking for me was kind of a risky concept at that time. It was a quiet, sleepy marina, with very friendly people, and was perfectly situated for the girls pick up taxi ride to the West Palm Beach Airport the next day. It was time for them to get back to their schools, jobs and life. Spring break for them was over. We enjoyed a simple home cooked dinner and relaxed on our last evening together. Thanks for coming Amy and Kathleen. We loved every minute of your visit! Tomorrow, we head off to familiar territory- Jensen Beach and Four Fish Marina.